As a child growing up in Lexington, Ky., Woods Baughman dreamed of being a rodeo rider. When that idea didn’t fly with his mother though, he turned his focus to basic riding lessons. A few years later, Baughman took a trip to the Kentucky Horse Park with his grandfather, and as he watched rider after rider gallop across the bluegrass at the Rolex Kentucky Three-Day Event, he knew he’d found his passion. “I remember sitting there watching the riders go by and saying, ‘I can do that. I want to do that.’ I’ve been working towards it ever since,” he said. Now Baughman is set to tackle the biggest event of his career this weekend at the Great Meadow International CICO*** on Montesquieu, a quirky off-the-track Thoroughbred that he’s brought up from the beginning. 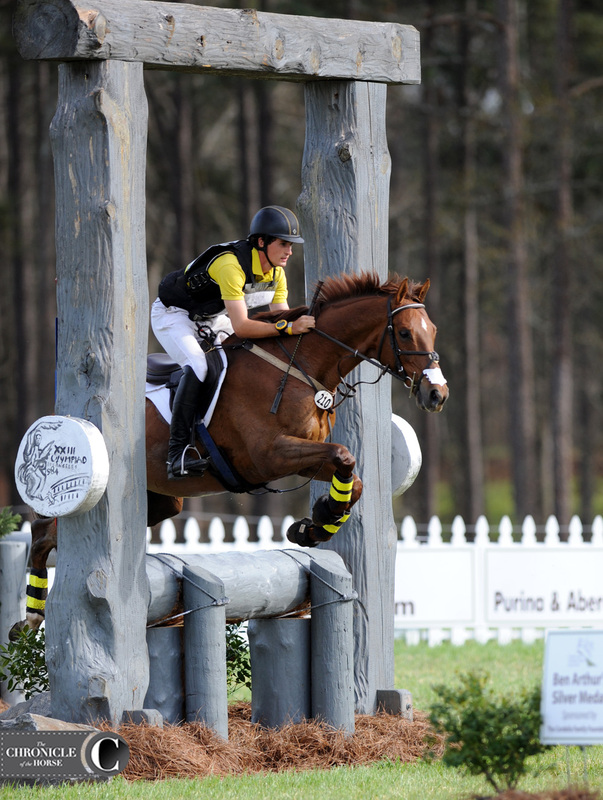 Woods Baughman and Montesquieu at the Carolina International (N.C.). Photo by Lindsay Berreth. Baughman, 21, started riding with Maggie Wright at Champagne Run Farm. His first event horse was a 14.2-hand Quarter Pony named Smoothie. “She unfortunately lost her eye when she was 4 years old, so she only had a right eye. I competed her up through novice, and when I was 14 I bought my first proper horse, ‘Trucker’ [Truckee Bash], who was off the track,” said Baughman, who trained with Wright for 12 years. With Wright, Baughman learned the ins and out of eventing with Trucker and Montesquieu, whom Wright had found at the track as a sales horse. Baughman begged his parents to buy “Lulu” (Marias Mon—Incredulous, Indian Ridge). Woods Baughman and Maverick McNamara at Plantation Field (Pa.). Photo by Lindsay Berreth. Baughman made it to his first intermediate horse trials and the CCI* level with both geldings and competed at the Adequan/FEI North American Young Rider and Junior Championships (Ky.) in 2014 with Trucker before he decided to try a winter stint in Ocala, Fla., with Sharon White, whom he’d met during an Area 8 young rider camp. Since 2015, Baughman has been a working student for White at her Last Frontier Farm in Summit Point, W. Va.
Trucker had an injury that meant he wouldn’t make it at the upper levels, so he’s since been sold, but Baughman acquired Maverick McNamara, a 13-year-old British Warmblood gelding (Medoc—Skippy) that had competed to the CCI*** level with Swiss rider Felix Vogg. Lulu hasn’t always been easy on the flat, but he’s a cross-country machine. “He was just born to run and loves to jump,” said Baughman. “It’s such a great feeling to gallop around on him. The dressage has been a work in progress since Day 1. It’s just not what he enjoys doing. It’s been convincing him that you can put your head down and go to work. White’s been a huge help, and with lessons from Linda Zang, Jacquie Brooks and Tracie Robinson on the flat, Lulu has come around, most of the time. Woods Baughman and Montesquieu at the Pedigree Bromont CCI** (Quebec). Photo by Kimberly Loushin. “[Sharon’s] really put an emphasis on just riding inside leg to outside rein all the time and being really exact in the dressage—just being really detail oriented all the way around; not letting anything slip past,” said Baughman. After a strong third-placed finish at the Virginia CCI** last fall, Baughman and White knew he was ready to move up to advanced. They made their first attempt at Rocking Horse Winter II (Fla.) in February but were eliminated on cross-country. At the Cloud 11-Gavilan North LLC Carolina International (N.C.) in March they put their left corner demons to rest and finished fifth out of 24 in the advanced. Baughman and Lulu did their first CIC*** at Jersey Fresh (N.J.) in May, but a 70.5 in dressage meant it wasn’t a qualifying score. “I haven’t quite mastered changes on him, so that put our score just over qualifying, but he made up for that when he stormed around in the mud with no issues on the cross-country,” he said. 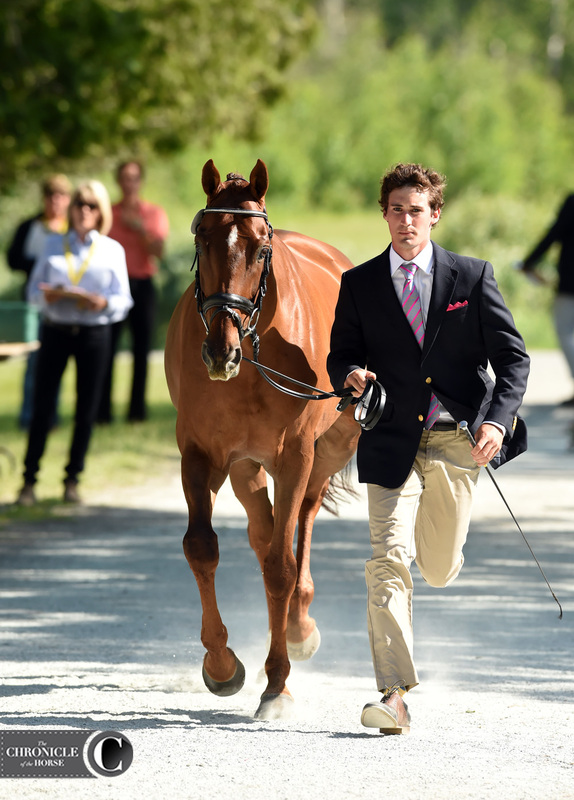 The pair finished 14th at the Pedigree Bromont CCI** (Quebec) last month, and after a break and some more dressage work, Baughman feels confident heading into Great Meadow. Watch Woods and Montesquieu at the Carolina International via RNS Video Media. 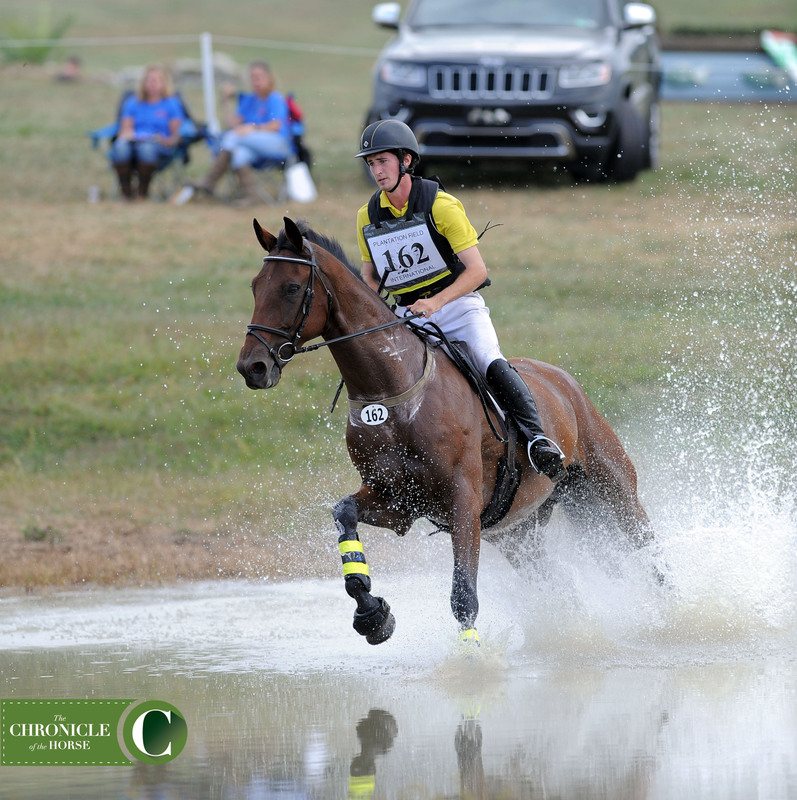 The Chronicle will be on site at the Great Meadow International this weekend to bring you lots of news and photos of the only eventing Nations Cup competition held in the United States. Stay tuned to coth.com and look for more in the July 24 print issue. For all the info you need about the Great Meadow International, including links to live-streaming, results and ride times, CLICK on What You Need To Know: The 2017 Great Meadow International.